In 2005, Winding Oak had been working for 17 years to provide print and website design to country clubs, asphalt testers, industrial researchers, small businesses, and a smattering of authors. At a weekend party, the woman below asked Steve and me if we would help her out on an upcoming project, the movie version of Because of Winn Dixie. She gave us until Monday to think it over. In that time, Steve and I talked about whether we should focus on children’s literature in our business … and the rest of that story is our history and future. 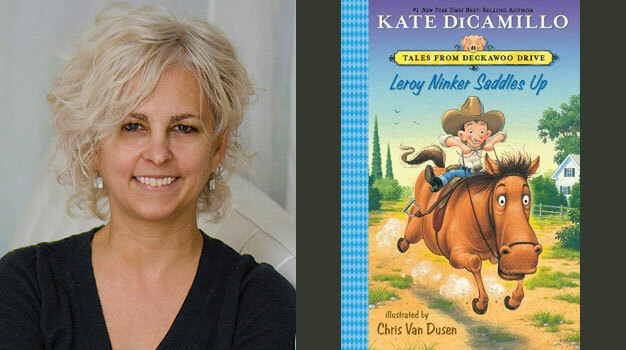 I am grateful to Kate DiCamillo for opening our eyes to a path that has brought us so many good friendships and such enjoyable work. We love our Winding Oak family. If you haven’t yet read Kate’s books, you probably should. I recommend Leroy Ninker Saddles Up, my favorite of all her many heartwarming books.